Gold price, How far goes the decline of the ounce? The price of gold rose from $ 1,876 to $ 1,138 an ounce (31,103 grams) or -40%. Is the price of gold in the trough? I. Gold in a downtrend since 2012. 1. The moving average to 200 days (MM200). Since the price of gold has fallen below its moving average to 200 days in early 2012, gold is in a bearish trend. We had a very nice bull signal on the gold ounce in early 2016 when it passed over its MM200. 2. Gold cross on gold at the beginning of 2016. When gold was passed over its MM200, its MM50 did the same. This figure is called a golden cross in technical analysis. It's bullish. 3. The deadly cross at the end of 2016. But by the end of 2016 the price of gold went below its MM200 with its MM50. This figure is called a mortal cross in technical analysis. I think his name is enough to explain this figure. For 15 years, my best friend to follow the price of gold is the MM200. 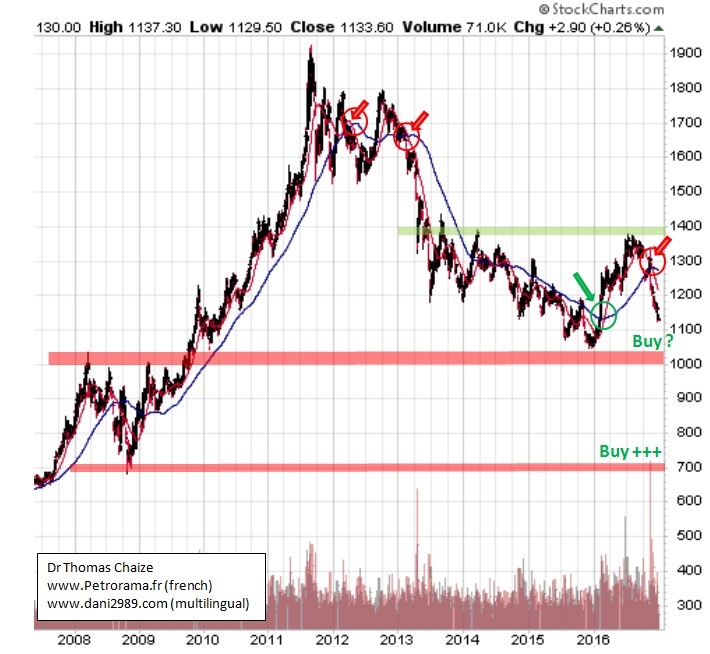 From 2001 to 2012 the price remained above and I wrote bullish subjects on the price of gold. Since the price of the ounce has passed below its MM200, I prefer not to write anything. I'm not here to write negative things about my favorite subject, newspapers are enough. It's been 7 years since I waited for a bull run (April 14, 2009). Because in the very long term nothing has changed. For gold it's heading north! 5. Still a little patience for gold. Being positive about the industry does not mean buying anytime! For this reason, two supports must be monitored. II. Supports the price of gold. The first support is at $ 1050- $ 1000. This support is also the old resistance of 2008 and 2009. Breaking this support would open directly the door of 700 dollars an ounce. We are not there, but if that happens I will write a subject with this title "buy, buy, buy". This is the kind of buying opportunity that only happens every 10 or 15 years (as for the price of oil below $ 50!). 3. What medium to choose to buy? - $ 1050 - $ 1,000 is a very strong psychologically strong support. The price is generally just below the cost of production of many large mining companies. The purchase in this price area is very good. - $ 700: Now things are clearer! Exceptional buying opportunity! From the point of view of technical analysis one has to choose one or the other, it is up to you to see! 4. Next topic bullish about gold on Petrorama? I like to have a margin of safety to become euphoric. We have an exceptional increase from 2001 to 2012. From the point of view of fundamental analysis, this increase was totally justified. On the exceptional rise, it seems to me as normal that we have an exceptional correction with a final phase of capitulation. I have not yet seen this last phase of capitulation. III. Do not underestimate the time factor. Physical gold must always be put into perspective over the long term. In the short term I think the casino offers better odds of winning! If the support at $ 1,000 does its job, it is possible that gold will fall for some time in a horizontal channel between $ 1,000 and $ 1,400 per ounce. For example 24/36 months. Whichever price scenario you prefer, be patient. - If this is not part of your qualities, become it or interest you in currency and day trading. - Commodities are long term. You have to wait at the bottom of the cycle, be able to buy when everyone will tell you it's silly. To conclude, we are already in a low price zone, which could experience a last wave of decline. This last wave would be unjustified from the point of view of mining fundamentals. But the price of gold is never reasonable. 1 ° wait for a technical signal of rise like the passage of the MM200 or a cross golden. (2) purchase the support at $ 1,000 and sell if it breaks. 3) Market efficiency (or undecided), you buy at fixed intervals over a very long period. 4 ° play the support break at $ 1000 and buy at $ 700.